Although it looks quite disconnected from the past in its shiny building on Richmond Drive, Perrine Elementary School boasts one of the longest histories in the county. In 1900, Richmond Drive consisted of logs laid side by side. They called it a “corduroy road” for obvious reasons. Where this bumpy ride met the bay, the beautiful and serene area we now know as the Deering Estate burst with human activity. Anchored by the bayfront home of Dr. Richmond, this area provided a dock which connected the town known as Cutler with Miami, and in turn the rest of the world. Farmers brought their fruits and vegetables for shipment to the dock, and locals purchased goods, received mail, and shared news and local gossip there. Also located on Dr. Richmond’s estate was a one room structure that served as a community school and church that boasted glass windows — a rare luxury in those early pioneer days. In September 1900, Miss Dolly Richardson began classes at the church/schoolhouse with eighteen students.Her roll book included the following pioneer children: Paul Lilly Lurleen Mary Roberts (Siblings) Paul and Charlie Pender (cousins) Charlie Fitch Hazel Falcner Maggie and Aggie Young (twins) Fred Ralph Jessi Fuzzard Walter and Elberta Moody. The school year went from September through June and Miss Robinson was paid $50.00 a month for her services. This hardly represented an exorbitant sum. But she could go to Burdines and buy a dress for $1.25 and shoes for $2.50 and six handkerchiefs for 50 cents. Also she had no gasoline, electricity, cable, internet or telephone bills which tend to drive up our own modern monthly expenses. By 1905, the activity around the bay area known as Cutler began to wane. Just a decade before the little town boasted a population larger than Miami, but that era rapidly came to an end when Henry Flagler’s railroad extension bypassed the town in favor of a more westerly route. His railroad passed through an area known as Perrine – the name of the owner of the original land grant. As a result of Flagler’s decision, a new center of commerce blossomed along the railroad right of way which ran where the bus lanes are today. Soon the area called Perrine exploded with human activity and Cutler began its transformation into the nest of tranquility we know today. The railroad brought a new wave of workers and their children into the area and soon they petitioned the Dade County School Board for a new school. At their August 10, 1905 meeting the Board approved the request. They named the new school Perrine, another sign of the demise of Cutler. A few days later on August 14 in a one frame building on the Barfield property, Miss Willie King began classes. Although she had only ten students, she had a full day, teaching six different levels of reading along with writing, grammar, history, arithmetic, and geography. By 1910 the student population had grown to 22 boys and girls and a new one room school house was built on the corner of U.S. 1 and Hibiscus Street – just north of today’s Eureka Drive where the Big Lots store stands. In the early days, the school year at Perrine only lasted until November 27, but in the new school the children began in late November and stayed in class until the end of June. In those pre air conditioning pre screen days, the environment probably had much to do in determining the length of the school year. It began when temperatures cooled and mosquitoes diminished, and the classes continued until the heat and the mosquitoes became insufferable. During the next few years as activity on the railroad extension increased, so did the student population at Perrine Elementary. By 1914 the numbers had grown to 45 and the school now had a principal –Albert Issac – as well as a teacher Floyd Bolton. Mr. Issac earned $100 a month to lead the school and Mr Bolton, received $50 for his teaching services. The school also boasted a library of 150 volumes. In 1915 MC Padgett became the principal and Gertrude Williams took over the teaching position. Together they taught forty five students in grades one through eight. Two years later, in June of 1916, the School Board received a $10,000 bond issue from the First National Bank of Miami and built a new school for the students of Perrine. That school would remain the home of Perrine Elementary until the 1970s when the County built the school that currently stands on Richmond Drive. The old building held memories such as these for hundreds of former students, but the area’s population boom of the 1960s and 70’s created a need for a new school. With the excitement of a new school and a new population, the long history of Perrine elementary moved to the background. But as new young faces enter the bright modern building on Richmond Drive they should know that they share in a long and proud heritage. 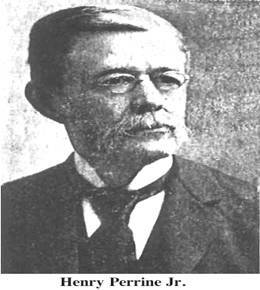 Dr. Henry Perrine was a noted horticulturist who became interested in cultivating foreign plants while visiting Cuba in 1826. Although trained as a physician in Illinois, poor health and harsh winters prevented him from living there. He moved to New Orleans and became an ambassador to Campeche, Mexico (1827-1838). As American Consul in Campeche, he learned of Mexico’s monopoly on rope making with a fibrous sisal plant. Dr. Perrine began to send the sisal seeds and other plants including the avocado to a friend living on Indian Key in Florida and to seek government support for obtaining land for agricultural experiments. In 1838 the United States Congress granted 230,000 acres of land in the southern extremity of Florida to Dr. Henry Perrine. Events of the Second Seminole War made it impossible for him to settle on his township and he took his family to Indian Key for safety. On August 7, 1840, Indians attacked the Key killing Henry Perrine. His family survived and later his son, Henry Perrine, Jr. with the help of Henry Flagler activated the South Dade Land Grant and established Perrinesville as a farming community.